As a family business manager, I’m sure you know when morale is high, profits are even higher. When employees, whether they are family members or not, are happy the whole company runs smoothly. All the cogs and wheels fit well and hum right along. However it’s so easy to get caught up in the day-to-day operations, especially during the holidays, that you don’t have the time to spend on soothing employee’s spirits. You must remind yourself if an employee’s spirits are uplifted, your job of managing the business will be easier. 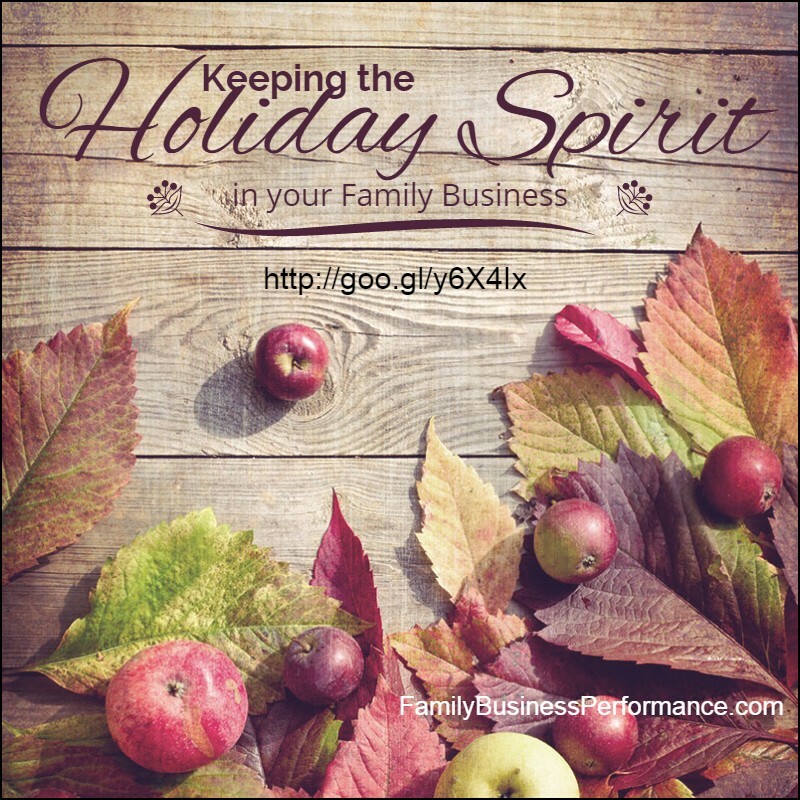 As the holiday season approaches, we should remember although it is meant to be a happy time, it is also full of stress and can damper the spirit in your family business. Here are a few tips to help you in the process of raising your employee’s spirits and have a smooth and profitable holiday season. 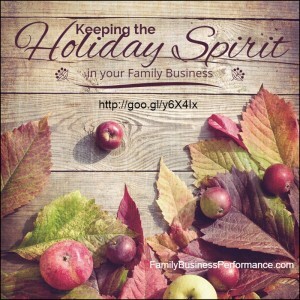 Do you have a family member or employee that works harder than most? For example, the kind that comes in early and leaves late? Then it is necessary and even vital to acknowledge that person. When you acknowledge your employee for their dedication, even in a small way, they will most certainly feel as though they are appreciated. They will know their efforts are not lost or wasted. As a bonus, not only will they feel appreciated, but you will almost certainly guarantee that this particular family member or employee will want to do even more. As family business manager you know that wanting to do more will equate to a more successful business. You can’t expect your family members or employees to be motivated if you are not. You need to exude the qualities you want to see in them such as enthusiasm and pride. In other words, lead by example. Adapt a cheerful disposition as you work diligently to get the job done. Show them that you, as the family business manager, are willing to roll up your sleeves and get into the trenches. When you model the behavior you want, chances are that your employees will be more than happy to join you in your efforts. There is that word again that I so often talk about: Communication. Here, as in many other areas of business management, is the key to success. You must let family members and other employees know that the door to your office is always open. If they think they can’t approach you with a concern, suggestion, gripe or observation, chances are they will not be happy. A happy employee is a productive employee and if you want to raise his or her spirits, keep the lines of communication wide open. Good communication inspires another important factor in managing your family business, trust. If all family members and employees trust that you have their best interest in mind as well as the businesses, they are more likely to communicate anything with you. Working out internal business issues will be easier and you can address problems before they blow up into disasters. So this holiday season, remember to keep an eye on your family members and employees spirits so you can all have a happy, productive and profitable holiday.